Suspected Al-Qaeda terrorists reportedly attacked a remote Yemeni military post near the Saudi border on Tuesday, killing several officers. The attack comes amid turmoil in Yemen which has already claimed over 540 lives, according to the WHO. 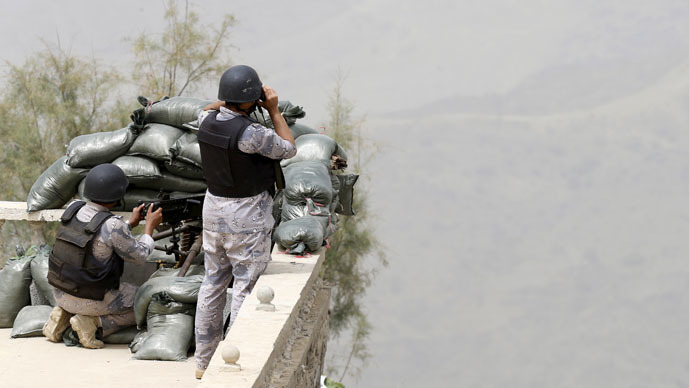 A remote border base was stormed by suspected Al-Qaeda militants near Manwakh, about 440 km (270 miles) northeast of Yemen's capital, Sanaa, Reuters reported, citing sources in the country's eastern Hadramawt province. At least two officers, including the senior border guard, were reportedly killed in the attack, with the militants taking over the post. Last week, terrorists from the Yemen-based Al-Qaeda in the Arabian Peninsula (AQAP) group, which is considered to be the most dangerous Al-Qaeda branch, attacked the Arabian Sea port of Mukalla in southeastern Yemen. The fighters seized a major army base and broke into the prison there, having freed hundreds of inmates, including AQAP militants and one of the group's top regional commanders. Residents say Al-Qaeda militants remain in control of around half of the town, Reuters reported. More than 540 people were killed and some 1,700 wounded in Yemen's multi-sided conflict since March 19, according to the World Health Organization (WHO). The toll was up to April 6, a WHO spokesman told reporters on Tuesday. After fierce Monday clashes between the Houthi rebels and President Hadi's supporters, more than 140 people were killed in the fighting, AP reported, saying the bloodiest clashes occurred in the main southern city of Aden. Meanwhile, at least 74 children have been confirmed killed since March 26, with another 44 kids having been injured in the conflict, the United Nations Children's Fund (UNICEF) said. But the toll is believed to be far higher, UNICEF added, also saying that more than 100,000 people have been displaced by the violence. On Tuesday, at least six children were killed during the coalition airstrikes on Yemen, led by Saudi Arabia, after a school was hit in central Yemen, a military source in the country told Sputnik news agency. Russia has urged the UN Security Council to push for a humanitarian pause in the strikes waged by Saudi Arabia and a coalition of Gulf monarchies, and the International Committee of the Red Cross (ICRC) workers have warned of a dire situation in the region. Red Cross's first plane with humanitarian aid landed in Sanaa, AP reported on Tuesday, after the ICRC finally received a permission from the Saudi-led coalition to send planes to the region after days of delays. The Red Cross is ready to immediately send more necessary aid, currently stored in Jordan, Djibouti and Switzerland. Meanwhile, the US is speeding up weapons supplies and stepping up intelligence sharing with the coalition, US Deputy Secretary of State Antony Blinken said on Tuesday. Earlier on Monday, the White House spokesman said that "the US military continues to support the efforts of Saudi Arabia and some of their partners in the region to try to address the security situation along their border that they're justifiably concerned about." The US is "forcefully supporting the UN-led effort to try to bring the violence to an end," press secretary Josh Earnest added.